Ehrlichiosis is transmitted by the American dog tick, the deer tick, the Lone Star tick, and (pictured) the deer tick, according to the U.S. National Library of Medicine. What is ehrlichiosis? It’s a bacterial disease of the white blood cells. Spread by ticks, ehrlichiosis affects all mammals, including people. Two bacteria in particular are known to cause the disease—Ehrlichia chaffeensis and Ehrlichia ewingii. A third, Ehrlichia muris, is being evaluated as another cause. According to the U.S. National Library of Medicine, ehrlichiosis is carried by the American dog tick, the deer tick, and the Lone Star tick. Initially found in the late 1980s, ehrlichiosis—pronounced air-lick-ee-OH-sis—has been on the rise. In 2000, the Centers for Disease Control and Prevention (CDC) reported only 200 cases of ehrlichiosis, all caused by E. chaffeensis. In 2016, more than 1,377 cases were reported. There are two different types of ehrlichiosis, although they cause similar symptoms. Human monocytic ehrlichiosis, or HME, was first described in 1986, according to tickencounter.org, a website posted by the University of Rhode Island. (For the record, you’ll find some sources that state 1987.) HME is caused by E. chaffeensis, which was discovered in 1991. Human granulocytic ehrlichiosis, or HGE, is an alternative form of HME. According to the website tickencounter.com, it was recognized as a new disease in 1993. In HME, the bacteria infect monocytes (the largest type of white blood cell). In HGE, they infect granulocytes (a type of white blood cell containing granules that are released during infections). HGE was renamed anaplasmosis in 2003. Anaplasmosis and ehrlichiosis are the second-most common tick-borne diseases after Lyme disease. In severe infections of ehrlichiosis, difficult breathing and bleeding disorders can occur, says the CDC. Approximately 1.8 percent of cases are fatal. 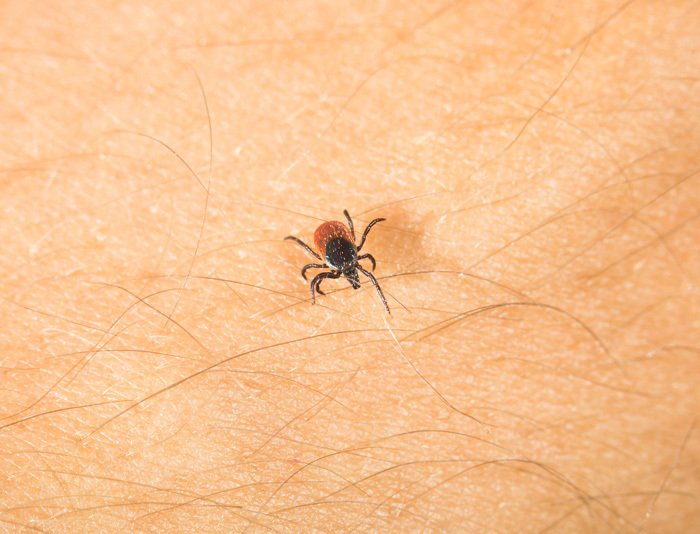 Physicians often diagnose ehrlichiosis based on symptoms, when a patient experienced a tick bite, and a blood test. Keep in mind that a single tick bite can spread more than one disease, which would cause multiple blood tests to isolate the exact cause. For treatment, your physician may choose to use prophylactic antibiotics (usually doxycycline; see below) without knowing the exact bacteria/disease. Diagnostic hope is on the horizon. A new blood test called the Tick-Borne Disease Serochip (TBD Serochip) promises a single test that can identify and distinguish among Borrelia burgdorferi, the pathogen responsible for Lyme disease, and seven other tick-borne pathogens, according to Nature: Scientific Reports. “The number of Americans diagnosed with tick-borne disease is steadily increasing as tick populations have expanded geographically,” says Rafal Tokarz, PhD, one of the reseachers who developed the Serochip. Having a single test to isolate the exact cause could be helpful in both diagnosis and tracking the spread of these TBDs. The first-line treatment for ehrlichiosis is usually doxycycline, a tetracycline antibiotic commonly used to treat other bacterial infections, including urinary tract infections and acne. These diseases are not contagious but having them once does not give you immunity. If you’re bitten by another tick carrying the disease, you can contract it again. Tick control is the key to prevention. Remember that ticks crawl onto a new host (they can’t jump or fly). They then walk around, looking for a good spot to feed. Ticks are often found on the head, pubic hair, armpit, ears, belly button, and back of the knees. The transmission of disease once you’re bitten by a tick is becoming a debated subject. While many sources state it takes 24 to 48 hours for the bacteria to be transmitted, others state that a tick can transfer disease as soon as it begins to feed. The CDC states they can begin to feed in as little as 10 minutes after moving to a host. Permethrin (0.5 percent) does a good job of repelling ticks. You can spray it on clothing and gear, too (it may remain protective through several washings, says the CDC). There also are commercially made permethrin-containing articles of clothing (ElimiTick, BugBeWear, InsectShield, Duluth Trading, LL Bean, ExOfficio, and Sawyer). Additional repellents that are effective include products containing DEET, picaridin, IR3535, oil of lemon eucalyptus (OLE), para-menthane-diol (PMD), and 2-undecanone. acne, antibiotics, autism, bacteria, diarrhea, ears, headaches, immunity, infection, lyme disease, lyme disease symptoms, muscle, muscle aches, pesticides, white blood cells.